Teaching children a lifelong hobby, instilling appreciation for our marine environment and providing fun, family outings are the objectives for Saturday's Kids' Fishing Clinic in Naples. 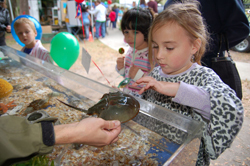 The Florida Fish and Wildlife Conservation Commission (FWC) will offer a free Kids' Fishing Clinic for children between the ages of 5 and 15 on Saturday, April 28. The clinic will take place at the Naples City Pier, 25 12th Ave. S. in Naples, from 9 a.m. to noon. Advance registration is not required. This free clinic enables young people to learn the basics of environmental stewardship, fishing ethics, angling skills and safety. In addition, environmental displays will offer participants a unique chance to experience Florida's marine life firsthand. Kids' Fishing Clinics strive for several goals, but the main objective is to create responsible marine-resource stewards by teaching children about the vulnerability of Florida's marine ecosystems. In addition, organizers hope to teach fundamental saltwater fishing skills and provide participants a positive fishing experience. Fishing equipment and bait will be provided for kids to use during the clinic, but organizers encourage children who own fishing tackle to bring it. A limited number of rods and reels will be given away to participants upon completion of the clinic. If conditions allow, participants will have the opportunity to practice their new skills and fish from the pier. This event is a photo catch-and-release activity, and an adult must accompany all participants. Individuals or companies interested in helping sponsor this event or volunteering at the clinic should call Laura Almand at 239-213-1441 ext. 203 or FWC's Nancy Fisher at 850-487-0554. To find out more on taking a kid fishing, go to MyFWC.com/Fishing<http://www.myfwc.com/education/outdoor-skills/fishing-clinics/>.